GUI: I’m doing fantabulous thanks Manny. MANNY: Excellent! I imagine you have picked out two fantastic questions for me? GUI: Sure have! Here’s the first one: “I’m getting prices from suppliers in China and many of them are giving me prices with the word FOB after it. What does FOB mean?” Oh! This one is very near and dear to me because I used to be an FOB – it’s Fresh Off the Boat, right? MANNY: Ha ha! FOB is an acronym and it means ‘Freight On Board’. With FOB the suppliers are saying that they’ll manufacture your products and get it ready, to the boat, it is your responsibility to cover the freight costs. When I started, I thought it was the final costs to get it to the US, it’s not the case – it’s just to get it to their shipping facility. GUI: It is important when you do your calculations to run the calculations on landed costs – figuring the shipping costs to get it to the US, otherwise you’re going to be way off. You have to figure out the shipping costs. MANNY: When you’re shipping via boat, sea shipping, you’re saving so much money. Your cost per unit goes way down. Instead of paying $5 per unit, you’ll pay under $2. You’ll save a lot on shipping when doing it this way. GUI: You can use that money for Pay Per Click and advertisement. MANNY: If you can cut down your costs for shipping, let’s say $3, over your competitor… that’s $3 per unit you can use to advertise on Pay Per Click to outrank them. There’s a whole podcast on that – go check it out at ampmpodcast.com. GUI: Great! I have another question for you. “Hi Manny. I’ve listened to all of your podcasts and I’m a member of your Facebook group. Thanks for putting out amazing content. I’m not yet selling but I’m about to order samples. Prices are pretty high. My product will cost me $5 when I buy in bulk, but to get one sample, the price is $30 plus another $25 for shipping. That’s $55 to what would cost $5 if I move forward. Should I negotiate down the price of the samples?”. MANNY: The thing about Alibaba is back in the day you could order a sample and get it at cost plus the cost to ship it out, so they’ve noticed that many people are not serious buyers – they only buy the product to not buy it at retail price somewhere else. So they now sell the samples at the normal retail price, not the bulk-buyer price. $30 is the retail price for that product then. The $25 for shipping cost is just business, anything between $20 and $40 is normal for shipping costs. A couple of strategies: if you’re dealing with a supplier and that supplier has multiple variations of that product, let’s say three, and you’re not quite sure which one you want, you can ask them to ship all three of them to you and usually the price per unit will come down. The shipping cost will go up but the unit cost will go down because they’re shipping it all together. I try to order as many units from the supplier at once so that I can see which units I want. The second thing: I always tell the supplier that when I’m going to do business with them, they have to deduct the sample costs that I have paid, from my first order and almost every time they’ll agree to that. GUI: She also asked if she should negotiate the price down? MANNY: Go ahead and try. They’re probably going to say no, but if they come back and say they will drop it down, you’re talking about minimal mounts. It’s not worth your time going back and forth on emails the whole day just to save $5. Just consider it business costs. They’re sending it by ExpressAir so you’re going to receive the samples faster. GUI: Julie, I think your time will be better spent negotiating the product cost once you decide to go with that product. Samples are going to be a one-time expense. If you decide on using the product you can negotiate as much as you like because 20 cents can make a huge difference if you’re selling 1000 units a month. 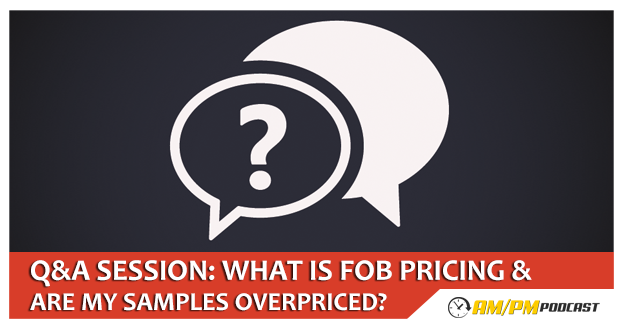 02:14 – First Q&A question of the day: I’m getting prices from suppliers in China and many of them are giving me prices with the word FOB after it. What does FOB mean? 06:30 – Second Q&A question: Hi Manny. I’ve listened to all of your podcasts and I’m a member of your Facebook group. Thanks for putting out amazing content. I’m not yet selling but I’m about to order samples. Prices are pretty high. My product will cost me $45 when I buy in bulk, but to get one sample, the price is $30 plus another $25 for shipping. That’s $55 to what would cost $5 if I move forward. Should I negotiate down the price of the samples? 11:30 – Should the price be negotiated?